SBP Banking Services Corporation SBP BSC 8th Batch Young Professionals Induction Program OG 2 Jobs Via NTS has been announce. You can apply online for the Career Opportunities in SBP. SBP Banking Services Corporation (SBP BSC) was established in 2001 as a wholly owned subsidiary of State Bank of Pakistan. As an operational arm of State Bank, SBP BSC is engaged in managing currency and foreign exchange operations; providing banking services to the government, financial institutions and general public; conducting development finance activities; implementing export refinance and other government subsidy schemes; performing agency functions like sale/purchase of prize bonds, prize money draws, national saving instruments schemes etc. 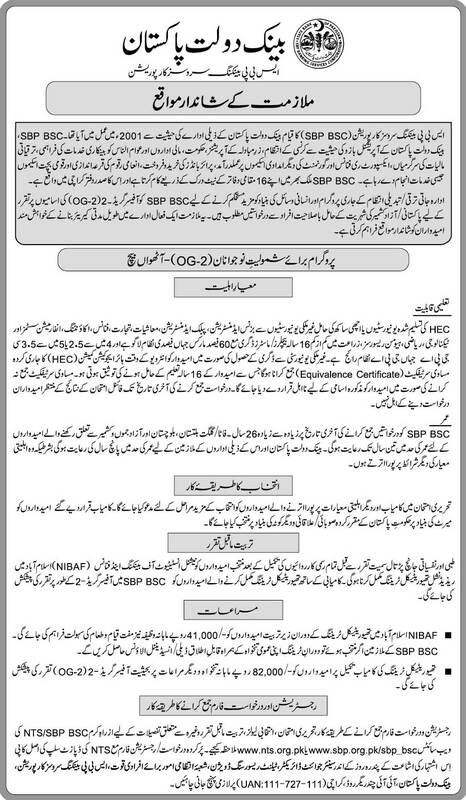 SBP BSC invites applications from talented Pakistani/AJK nationals to join it as Officer Grade-2 (OG-2). 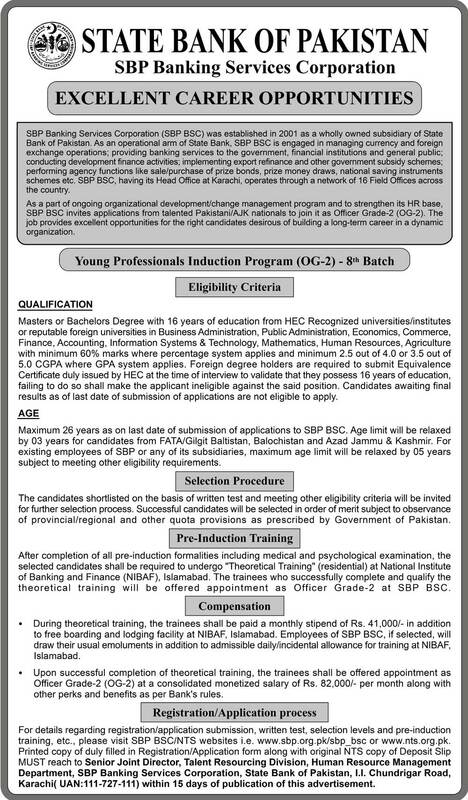 All those candidates who have the require qualification and are eligible for the SBP BSC 8th Batch Young Professionals Induction Program OG 2 Jobs Via NTS must apply to grab this golden opportunity. Applying procedure as well as other requirements for the jobs in SBP BSC 8th Batch are mention below. How to Apply For DSJ District Session Court Lahore Jobs Via NTS ? Candidates can apply online form the NTS website. You can also apply online form here. Deposit test fee of Rs. 300/- through printed deposit slip at any designated branch of ABL/HBL/MCB/MBL against the testing services to be provided by NTS..
Last date to apply is Monday, 15th April 2019.